Blood analysis is an important key to maintaining good health, as early diagnostic tests are provided. If any medical conditions should be detected as a result of such testing, this will allow patients the opportunity to seek early medical treatment with the hope of deterring such conditions. In order for the result of any blood analysis to be effective and reliable, proper phlebotomy equipment is required. With such equipment, a trained, certified, licensed phlebotomist will have the tools necessary to perform easy venipuncture procedures which will allow for accurate test measures. In order for a phlebotomist to perform a venipuncture procedure, specific laboratory tools are required. Although there are numerous tools of which a phlebotomist may use, some tools are more common than others. Such examples include butterfly needles and evacuated collection tubes. Additionally, in order for a phlebotomist to perform his or her job quickly and efficiently, specific laboratory furniture is also required. Although phlebotomy tools and furniture may vary according to what is necessary for the patient, some supplies are commonly used among all phlebotomists. As a phlebotomy technician, it is wise, and of course mandatory and common practice, to make use of personal protective equipment or PPE. 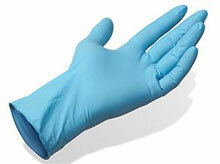 Non-sterile examination gloves are an example of such equipment. As any healthcare professional learns throughout his or her years of study, the safety and health of the professional comes first. With this in mind, it is imperative for the phlebotomist to always wear such a protective barrier. By doing so, he or she is protected from the possible contamination of blood related pathogens that may be present within the patient. The use of these gloves also provide a protective barrier for the patient, as he or she will not be exposed to pathogens that may be present on the hands of a phlebotomist. This is important to the patient, as such disease causing organisms can enter the body through an injection site during the blood collection process. In order for examination gloves to be effective, proper use is required. Prior to using these gloves, the phlebotomist should wash and dry his or her hands thoroughly, as this further decreases the possibility of cross contamination from healthcare worker to patient. When applying these gloves, it is necessary to choose the correct glove size and align the thumbs according the design of the gloves. By doing so, this helps to ensure the proper fit of such gloves in addition to the ease of manipulating other phlebotomy equipment. After the blood collection of each patient and manipulation of the corresponding blood specimen, the exam gloves should be discarded in a careful manner. To remove the gloves properly, the index finger and thumb of one hand should be used to grasp the cuff of the glove on the opposite hand. In this manner, the glove should be removed completely, turned inside out and compressed by the gloved hand. To remove the remaining glove, the index finger of the bare hand should be used. This finger should be placed inside the cuff of the glove that remains, as it removes the glove by completely pulling it off the hand and over the compressed glove. Careful removal of such gloves protects phlebotomists from exposed pathogens. A tourniquet is another common laboratory tool used by phlebotomists. This piece of phlebotomy equipment is used as a vein compressor. Consequently, it prevents the return of venous blood to the heart. The prevention of blood flow to the heart causes the vein beneath the tourniquet to become enlarged with blood. 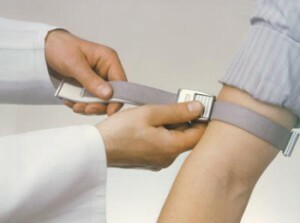 This technique allows the vein of interest to become easily palpable and visible to the phlebotomist. As such, it allows for an easy venipuncture procedure. The application technique concerning the tourniquet is quite simple. As a rule, it should be situated 3 to 4 inches above the site to be injected. This location is the forearm. As a patient’s arm is placed on a desk, the palmar side of the hand should face upward, as this will allow the elbow to face the desk. Once the arm is in this position, the tourniquet should be placed under the forearm. A partial tie should be completed by crossing the ends of the tourniquet once and partially tucking one loose end. Partial ties are always made on the antecubital fossa side of the arm. As the last evacuated is being filled, the pull on the tucked end of the tourniquet will allow for an easy release. 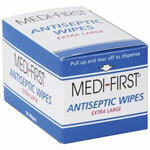 Phlebotomists are in constant need of antiseptic materials, as they are frequently used and necessary for all patients. Antiseptic materials such as alcohol pads are commonly used to disinfect the area to be punctured for the collection of blood. Alcohol pads are opened with the use of non-sterile examination gloves immediately before the venipuncture process. The alcohol pad remains in the pack until it is ready for use. When disinfection is required, the phlebotomist disinfects the area using an outward circular motion. All used antiseptic pads should be discarded in regular trash receptacle. 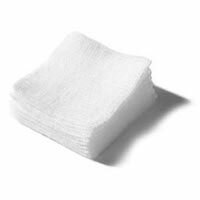 At the completion of a venipuncture procedure and prior to withdrawing the needle, a 2-by-2 inch gauze pad is used. These pads are used by phlebotomists to apply pressure to the venipuncture site and maintain sterilization. Applying pressure causes bleeding to cease and initiates the blood clotting process. Additionally, it helps with the prevention of bruising in the form of a hemotoma. A lancet is another common tool used by phlebotomists. This laboratory tool is generally used on the finger or heel of an infant or young child during the venipuncture process. The use of this tool makes the blood collection process e asier for infants and younger children, as it quickly punctures the capillaries of the suggested area and is immediately removed. This process helps to generate less pain and discomfort experienced by these patients. A lancet may be used once the withdrawal site is properly sterilized. A used lancet should be immediately discarded into a sharps container. 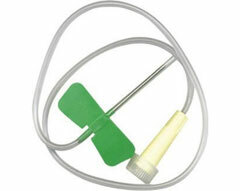 Needles are a required tool by all phlebotomists, as they are always in demand due to constant use. For a phlebotomist, the sole use of a needle is to puncture a vein with the intention of obtaining venous blood for diagnostic testing. The most commonly used needle is the butterfly needle. To properly use this needle, the phlebotomist should thoroughly wash and dry his or her hands prior to applying the nonsterile examination gloves. Once the examination gloves and tourniquet are applied, the venipuncture site should be palpated and sterilized in an outer circular motion. Upon the completion of sterilization, the butterfly needle should be uncapped and handled by the wings. At this point, it is necessary to insert the evacuated tube into the hub without piercing the tube’s rubber cap. Once the needle is held in the dominant hand with the bevel facing upward, the thumb of the non-dominant hand should be used to hold the vein in a steady position. As the needle is inserted at a 15 to 30 degree angle and blood is visibly seen entering the needle, the tube should be pushed further into the hub allowing the cap to be pierced. Prior to withdrawing the butterfly needle, the tourniquet and the evacuated tube should be released. This should occur midway through the process of filling the last evacuated tube. 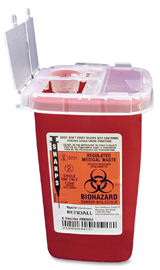 The use of a sharps containers are mandatory in all laboratory and medical settings. Such containers help to control the level and exposure of pathogens. The use of these containers are necessary for the proper and safe disposal of used needles, syringes, lancets and any tool that can cause an incision. These containers are red in color with a biohazard sign and simply require the deposit of such used equipment. Evacuated collection tubes are necessary for phlebotomists to complete venipuncture procedures. These tubes may be plastic or glass with a colored, rubber top. The color of each top will vary in accordance with its additive to indicate the specific diagnostic test to be performed. Before a butterfly needle is inserted into a vein for the withdrawal of blood, a tube with a sterilized top is inserted into the hub of a butterfly needle without being pierced. Once the needle is inserted and there is a flashback of blood, the tube is pushed further into the hub allowing the top to be pierced and blood to be forced into the tube. The force of blood is caused by a vacuum created by the tube. The tube should be removed following the removal of the tourniquet. During the final process, the tube should be inverted approximately 6 to 10 times to ensure a thorough mixture between blood and additive in addition to being properly labeled for diagnostic testing. A centrifuge is commonly used among some phlebotomists to prepare the specimen for diagnostic testing. These machines rotate at high speed allowing for the separation of blood into its various components. This procedure is necessary, as specific components of blood are required for diagnostic testing. When evacuated tubes are placed in a centrifuge, each tube must be placed in an opposite position in order for the machine to remain balanced. The minimum tubes required are two, as this will allow the machine to be balanced. If one tube of blood is to be spun for testing, a tube filled with water should be placed opposite the blood-filled tube. The amount of water should equal the amount of blood to allow proper balance. 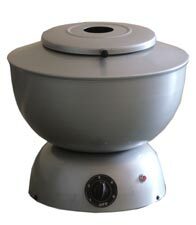 Prior to starting the machine, the lid should be closed and the temperature should be set between 20 and 22 degrees Celsius. According to the tube, the spin time could range from 5 to 10 minutes. A blood drawing tray or phlebotomy tray, as commonly known to many, is a form of furniture that is required by all phlebotomy technicians. The use of such tray allows for the organization and easy access of required phlebotomy tools. 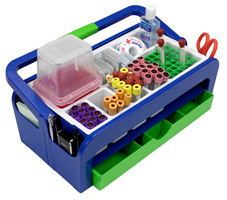 This tray can easily be used to fit the schedule of any phlebotomist. If a phlebotomist’s work station is a laboratory setting, a blood drawing tray may be situated in a fixed location for easy access. If, however, the technician is a mobile phlebotomist, the tray can easily be used to travel to various locations. In either instance, it helps with the organization of phlebotomy tools. Laboratory Label Printers are crucial for the job of a phlebotomist. These printers allow the phlebotomist to correctly print and label laboratory specimens for diagnostic testing. It is imperative that a phlebotomist correctly label each specimen in accordance with the requisition form. The correct spelling of a patient’s name in addition to the correct date of birth are factors necessary to correctly identify the type of blood analysis needed for each patient. This is important, as it could lead to the early diagnosis of any medical condition and the appropriate medical treatment. Phlebotomists are always in need of requisition forms. These forms are necessary, as they are used to inform phlebotomy technicians of specific tests required. Requisition forms may be used to request laboratory testing concerning hematology, HIV, pathology or a myriad of other diagnostic tests. 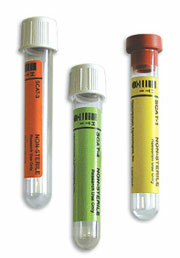 Upon the completion of a venipuncture procedure, evacuated collection tubes are properly labeled and corresponding labels are placed on such form. This provides verification concerning the order being fulfilled. These forms are also used during the identification process of each patient. Prior to the venipuncture procedure, proper identification of each patient is required in order to ensure proper healthcare is given to the appropriate individual. Information contained on a requisition form is compared to the information given by the patient during each laboratory visit in addition to any medical records available. Such information includes the patient’s full name, date of birth and address. 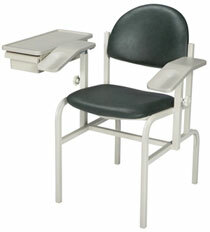 Blood draw chairs are chairs that are commonly used in laboratory facilities. These chairs are welcomed by many, if not all phlebotomists, as they allow for a positive experience concerning the easy positioning of patients during a laboratory procedure. Although the style and durability of these chairs may differ due to the various manufacturing companies, there are some features which may be common among all lab chairs. As such, these laboratory chairs usually consist of a lever or pedal that may be manually used to adjust the height of the chair. Additionally, these chairs usually consist of an adjustable arm rest and features that allow for the rotation to a desired position. Some chairs are also made with a small table and a reclining feature. The reclining feature may assist patients who experience dizziness due to the venipuncture procedure. Although there are many tools a phlebotomist must use, some of the commonly used tools are previously noted. Other commonly used tools include bandages and tape. These tools, in addition to the common use of office equipment such as file cabinets, storage cabinets and computers help a phlebotomist to stay organized and perform his or her job smoothly and efficiently. As these tools are necessary and provide a vital function, its use helps to provide a positive experience for both the phlebotomist and the patient. Hello, I’m a Nurse who does Resus training, checks and repairs B/P machines and scales. Hello Brian. Thank you for your comment. A couple of days ago, I wrote an article about venipuncture training arms. I think you will find what you are looking for. If you need more help, please reply to this comment. I am a mobile phlebotomist who requires to purchase a centrifuge machine for 6 – 8 tubes and 15 RPM per min. Can you recommend one I could buy?